Ingredients: Bread Crumbs (Bleached Wheat Flour, Salt, Yeast, Dextrose, Partially Hydrogenated Soybean and Cottonseed Oil), Wheat Flour, Corn Meal, Partially Hydrogenated Soybean and Cottonseed Oil, Soy Flour (contains Soybean Oil and Soy Lecithin), Salt, Paprika (color), Dextrose, Sugar, Spices, Garlic Powder, Onion Powder, Torula Yeast, Malt Extract, Corn Oil, Natural Flavor, Maltodextrin (from corn), Paprika Extract (color). Moisten with water: 6 to 8 pieces bone-in chicken (2 ½ lbs), with or without skin or 2 lbs. boneless skinless chicken breasts. 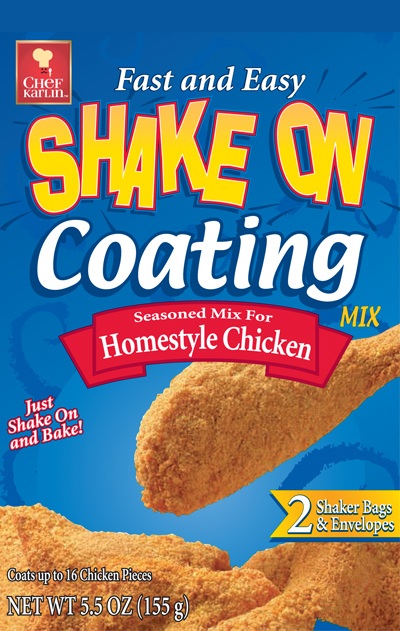 Shake 1 or 2 pieces at a time in bag with one packet of coating mix. (Dispose of bag and any remaining mix). Bake at 400°F, uncovered on an un-greased or foil lined baking sheet (15″ x 10″ x 1″) until thoroughly cooked (minimum internal temperature of 165 F). Bone-in Chicken: about 45 minutes. Boneless Chicken: about 20 minutes. Do not turn chicken while baking.